I’m Mark Griffin, and this is my obsession with music. Here you’ll find lovingly-curated mixes, eclectic recommendations, tips on identifying mystery songs, appreciation of record stores around the world, and odd manifestations of the soundtrack that’s always playing underneath my conscious thoughts, with a general focus on music that feels overlooked—be it old or new—but still deserves to be heard. Among it all, I hope you’ll discover something enjoyable to listen to. Originally from Cincinnati, OH, I’m now in Charlottesville, VA but my heart—and stomach¹—still belong to the Midwest. Although not from a musical family, I was lucky to grow up surrounded by good influences: Mr. Rogers gave me warm, fuzzy feelings for piano jazz, and Schoolhouse Rock showed me that catchy-but-erudite songwriting could be the most effective teacher. Thanks to friends who were blessed with older brothers’ record collections, the first song I learned to play on guitar—around the age of 10—was Devo’s “Gut Feeling,” and hearing Adam and the Ants’ “Dog Eat Dog” a couple of years later set me firmly in search of whatever couldn’t be found on American Top 40 radio. And then, happily, came WOXY 97X FM. Based just outside of Oxford, OH, this pioneering, family-owned alternative radio station began broadcasting in late 1983 and changed my life: not only by way of the music, but through the community of fans and DJs that coalesced around WOXY’s mission and remains like a close-knit family today despite the station’s eventual demise in 2010. You’ll find a couple of my tributes to it here and here. 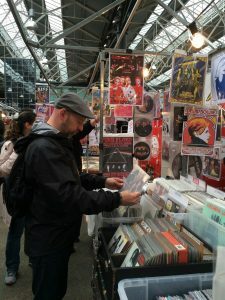 Record stores are some of my favorite places in the world and always the first thing I seek out when traveling the globe (as I’m fortunate to do with my partner Jane, an author and consultant). Even having been a musician, singer and songwriter, my strongest relationship has always been with recorded music rather than with live performance. In my teens I loved replicating songs with just my guitar, some effects pedals and a Yamaha four-track; disassembling the parts and trying to understand how the sounds were made and overlaid. I derive that same joy now from making the mixes on this site, often spending months on each one, painting with sound: finding through-lines, creative juxtapositions and long-form dynamism. I’m also an archivist at heart, and can easily while away entire days adding and tweaking metadata in my iTunes library or digitizing old cassettes and LPs. That love of cataloging—being deep in the weeds of genre classifications, sonic characteristics, etc.—led me to successfully assist online strangers in identifying songs whose artist and title had eluded them for years. The deductive methods I used are explicated here, the most popular post on this site. If you’ve got a mystery song, I hope these techniques help you on your quest. I can also be located on Tumblr, Instagram and Twitter, where you’ll find myriad other music-related thoughts—ones that feel too small and ephemeral to demand a full blog post—as well as occasional expressions of my other interests: travel, searching for the perfect doughnut, word play, and pithy observations on the mundane seen while walking dogs for hours every day. And if you’d like to know what I’m listening to, I’m always scrobbling to my Last.fm account here. I could opine all day about Virginia’s lack of Skyline Chili, goetta and the Midwest’s kaleidoscopic array of outstanding doughnuts.